Most workers are covered by the Family Medical Leave Act, which allows up to 12 weeks of leave per year to care for family members. But that leave is unpaid. Now, Republicans are making paid family leave a legislative policy. Washington Gov. 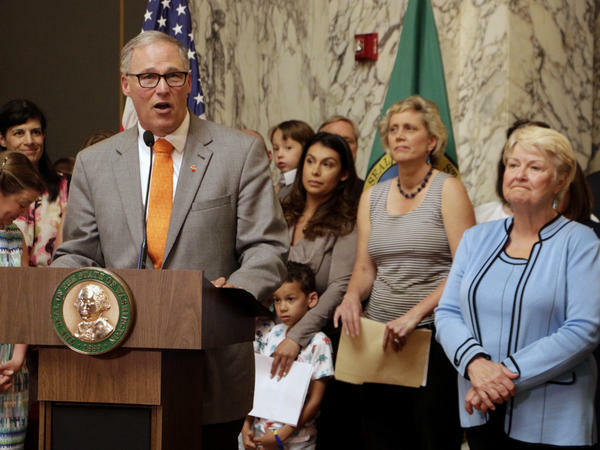 Jay Inslee, surrounded by lawmakers and other supporters of paid family leave, speaks before signing a state law to guarantee such leave on July 5, 2017, in Olympia, Wash.
Ellen Bravo, executive director of Family Values@Work, a national coalition of advocates for paid family leave, says in the past decade voters have been embracing paid family leave across party lines. Last month, Lukas' group suggested tapping into Social Security early — inspiring the proposal from Sen. Rubio. She opposes creating a new entitlement program, and refutes critics of the proposal who say it would delay retirement, especially for low-wage women. It's rare here in the U.S. to get paid time off to care for a new child or sick family member. Federal law permits taking the time off, but only 14 percent of private sector workers get paid for it. Democrats have long argued for a federal policy of paid family leave, and now Republicans, including President Trump's daughter Ivanka, are talking up their own proposals. NPR's Yuki Noguchi reports. 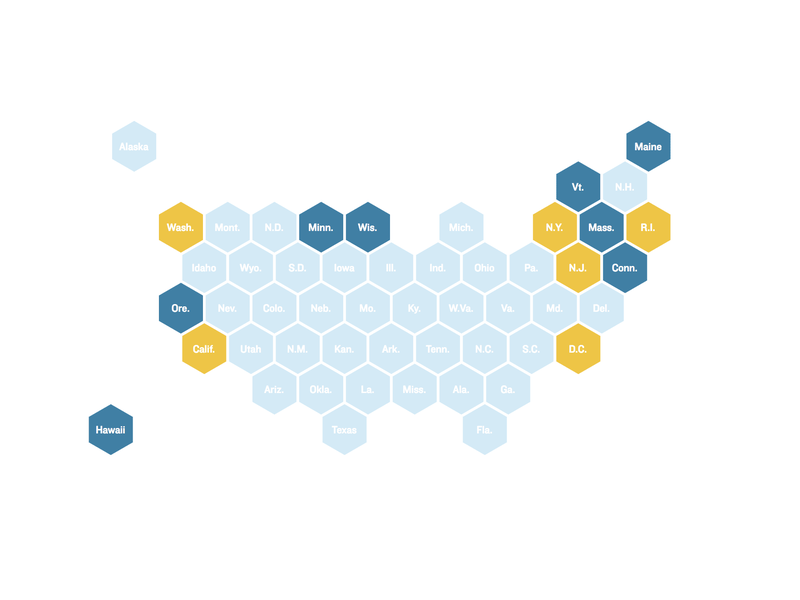 YUKI NOGUCHI, BYLINE: The discussion around paid leave in Washington, D.C., in some ways mirrors what happened last year in Washington state. Joe Fain, a state senator, says the legislature and business community there acted after cities adopted ballot measures to expand leave. JOE FAIN: There were a number of businesses that were looking at proposals out of the city of Seattle that really weren't affordable for businesses to be able to pay. And I think there was a desire by some to say, hey, let's get together, let's create a framework for a state-wide plan. NOGUCHI: Fain, a Republican, took paid leave when his son was born and became an advocate. Just as cities pushed Washington state to act, he says states like his are now pressuring federal lawmakers. FAIN: A number of states are in a position to act immediately, and I think they should do so. NOGUCHI: Congressional Republicans have a couple of proposals. Most recently, Florida Republican Marco Rubio has said he is drafting a plan to allow workers to draw on Social Security funds to cover leave for the birth or adoption of a child in exchange for delaying payments at retirement. A House Republican bill would set a minimum number of paid leave days employers could offer in exchange for not having to comply with other state or local leave laws. Ellen Bravo is executive director of Family Values @ Work, a national coalition of paid leave advocates. ELLEN BRAVO: We're glad to see the conversation get sparked, but we're also committed to a policy that works that isn't a step in the wrong direction. NOGUCHI: She says Republican proposals to date falls short. The problem, she says, is they don't cover enough and don't require employers to offer paid leave. Instead, Bravo supports the FAMILY Act, a Democrat-backed proposal that splits the cost of leave between employers and workers. It would increase payroll taxes by a few dollars a week to pay for up to 12 weeks of parental or medical leave. Marilyn Watkins of Seattle says policies need to cover a broad range of life events. MARILYN WATKINS: Three years ago, my mother died, and my sister and I were able to drop everything and spend the last weeks of her life caring for her. That was really important for our family. NOGUCHI: Watkins is policy director for the Economic Opportunity Institute and had paid leave from her employer but says she knows plenty of workers who don't. WATKINS: The only way to make these programs universal is through social insurance. NOGUCHI: But for some conservative groups and business interests, a universal federal paid leave requirement or an increase in payroll taxes to pay for it are unwelcome. Carrie Lukas is president of the Independent Women's Forum, an advocate for free market policy. CARRIE LUKAS: Mandating that all companies must provide paid leave to their workers - well, the problem with that is it makes hiring more expensive. It reduces job opportunities. NOGUCHI: Last month, Lukas' group published the idea of tapping into Social Security early, inspiring the proposal from Senator Rubio. Critics of her group's proposal say that would delay retirement, especially for low-wage workers. Lukas doesn't agree. LUKAS: I don't think it's a tremendous hardship to delay receiving retirement benefits from 67 to 67 1/2 if you decide to use a bunch of parental benefits. NOGUCHI: If a federal policy does pass, one of the big questions is how it would affect state and local laws. Lisa Horn, director of congressional affairs for the Society for Human Resource Management, says uniform policy is a key point for employers. A patchwork of different laws, she says, makes compliance difficult for them. LISA HORN: Sometimes they can find themselves trying to comply with one law, maybe the state law, and running afoul of the local law. NOGUCHI: Both Republicans and Democrats want to see national legislation addressing paid leave. It's less a question of if, they say, but a debate over what's covered and how to pay for it. Yuki Noguchi, NPR News, Washington. Transcript provided by NPR, Copyright NPR.